Save yourself hours of work! 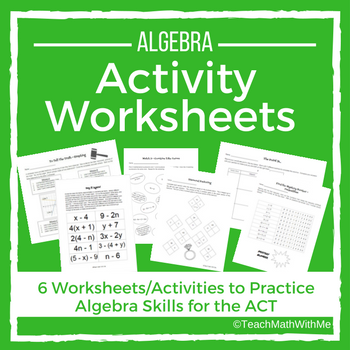 Get the first 3 days of lesson plans from my new Math ACT Prep Curriculum FREE! View my latest math ACT Prep resources. I created the resources for TeachMathWithMe.com because I love math! Math is a subject that has always been easy for me, and I enjoy helping students learn math skills too! I have tutored students in various levels of math for many years, and now focus primarily on ACT math prep. The ACT is an important test for many students. Thus, many schools are providing ACT Prep classes for the students (which is great! ), but teachers are often already loaded down with their regular class tasks. That's where I want to help. 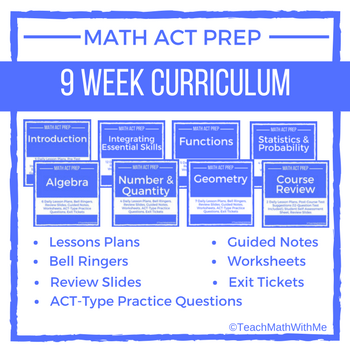 I have created lots of math resources, including a 9 week Math ACT Prep Curriculum, that will help teachers provide a great math review for their students in preparation for the ACT. I've done the work of reviewing ACT tests, working up examples, and putting it all together. I want to help teachers do their very best for their students. 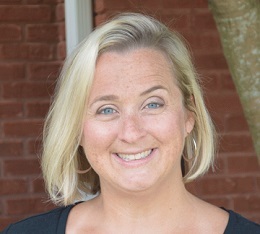 I hope to connect with many teachers in this journey and provide the resources you need. 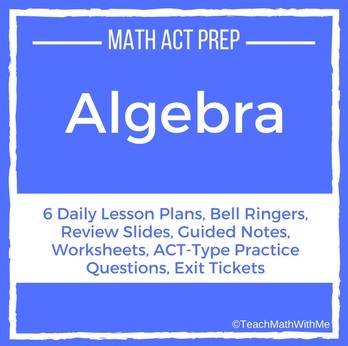 Let me help you prepare students for the ACT math section today! ACT is a registered trademark of ACT, Inc. ACT is not affiliated with Teach Math With Me, this website, or any products within.